ACCORD, NY – Accord Speedway Promoters Gary and Donna Palmer welcomed in a crowd of 200 members of the racing fraternity on Sunday evening as they hosted their seventeenth annual Accord Speedway Banquet and Awards ceremony. The banquet took place at the Hudson Valley Resort just a few miles away from the speedway in Accord, New York. 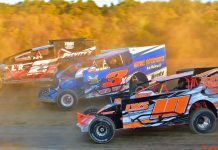 The Palmer family completed another successful racing season at their pristine and exciting quarter mile speedplant nestled within the valleys of the Catskill Mountains. 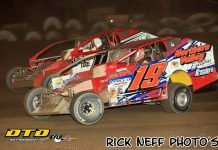 Although Mother Nature presented some problems along the way in 2017, the racing season proved to be both exciting and intense as a few of the championship titles came down to the final night of points at the speedway. After a joyous and fun-filled cocktail hour, sumptuous dinner and dessert, the evening’s emcee and track announcer Steve Pados and his assistant Tim Adams took to the stage to begin the awards presentations. Division by division was announced as spectacular hardware and awards were handed out to all of the speedway’s champions and attending place finishers. The Champions also received championship jackets. The Friday night headline division presentations quickly followed. Beginning with the Want Ad Digest Junior Slingshot division, driving talent “The Cold Spring Kid” Jake Mason picked up the championship hardware after riding high on the strength of an eight win season. Jayden Sleight picked up third place honors and also scored his wins at the speedway in 2017. 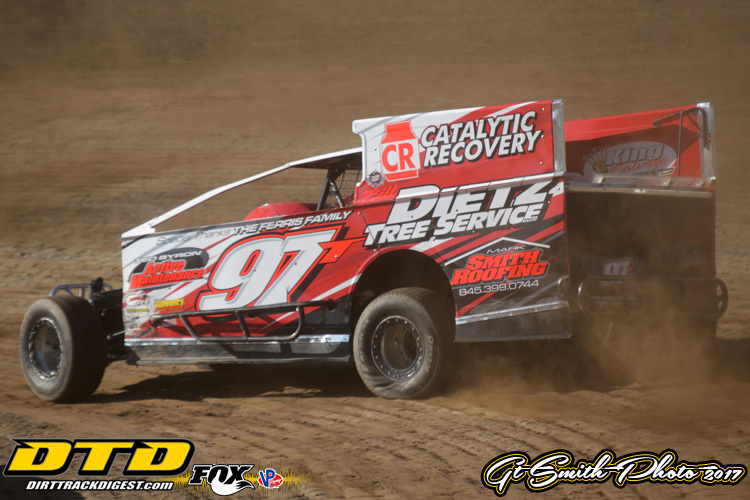 In the hotly contested Upstate Auto sponsored Pure Stock division, Travis Brockner captured the championship title highlighted by a two win season and capturing the title on the final night of the season in the highly competitive affordable division at the speedway. Also honored were high place winners Ray Tarantino, Steve Williams, John Hechinger, Bob Sleight Jr, Chris Kanuk and Austin Smith. The Arkel Motors Sportsman title found “The Bushkill Bullet” Kyle Rohner returning to the speedway and capturing his third championship at the Accord facility. Tyler Johnston, Cole Hentschel and Matt Shultz also picked up their hardware for a season well done. In the United Pump and Tank Modified division, “Showtime” Danny Tyler emerged as the champion, his first ever Modified title at the speedway. Tyler was a three time winner during the season which included capturing his ever “King of the Catskills” victory. “The DC Express” Danny Creeden, Richard Smith, Scott Ferrier, Jimmy Wells, Jesse Marks, Joe Judge and Kenny Ferrier were recognized as place winners in the division. Former speedway Quad Champ, “The High Side Hustler” Eric Jennings became the third champion in the still relatively new WRWD RAdio Sprint Car division at the speedway. Jennings scored five wins during the season. Bob Tersillo, Doylestown, Pennsylvania hot shoe Heidi Hedin and Branden Gates were also honored. Many special honors were also handed out during the evening. The top Crew Chiefs were honored and the winners included Bubba in the Modifieds, Bobby Hentschel in the Sportsman and Laurie Brockner in the Pure Stocks. Most Improved Driver Awards went to Tyler Johnston in the Sportsman and Richard Smith in the Modifieds. Rookie of the Year Awards were given to Bob Tersillo, Cole Hentschel and Jimmy Wells. Jim Silinski was honored for his tremendous organization of the spectacular First Responders Night at the speedway in 2017. Special Tribute Awards were given to the Tyler Family and the Hedin Family. Frank Bush and Jim Douglas were honored for their great work in bringing the firdst Accord Drivers reunion to fruition. Donnie Fredericks and Butch Rougier were honored for their fine work as the speedway safety crew. Benny Campbell was honored for his great tech work. “Uncle” Mike Hansen from WRWD Radio was honored for his dedication to racing. Employee of the Year honors were given to Wayne Kershaw. Special Appreciation awards were given to Miss Accord Speedway Michelle Campbell as she was honored for her work at the speedway. Ton Czaban was honored for his track videography work at Accord. Tim Adams was honored for his work behind the mike and in victory lane. Announcer and Media Man Steve Pados was honored for his long-standing service to the speedway and for keeping the fans well informed with his lively banter over the course of the racing season. A Special Dedication To Racing Award was bestowed upon race director Dave Rocket and his wife Joanne. A special dedication award was also given to “The Godfather” Marty Dibble. AARN writer Bill Utter was honored for his journalism work at the speedway. RJ Smith was honored by the Palmer Family for his dedication to racing. Early practice sessions will open the speedway in 2017 with April 6th and April 13th practice time on tap for the drivers in all divisions to prepare for the 2017 season. April 20st will find the Palmer Family opening the speedway gates for their 18th season at Accord. For further updates and information regarding all of the news and additions to the Accord Speedway, log-on to the their well documented website at: http://www.accordspeedway.com or call the speedway hotline at: 845 626 3478.